Today’s The Nation on Sunday carried for the first time the Ministry of Finance, Economic Planning and Development’s Press Release on MWEITI – Malawi Extractive Industries Transparency Initiative. The Ministry will submit its application to the EITI Board during the first half of the 2015/2016 fiscal year. This is most likely to happen in the next couple of weeks. 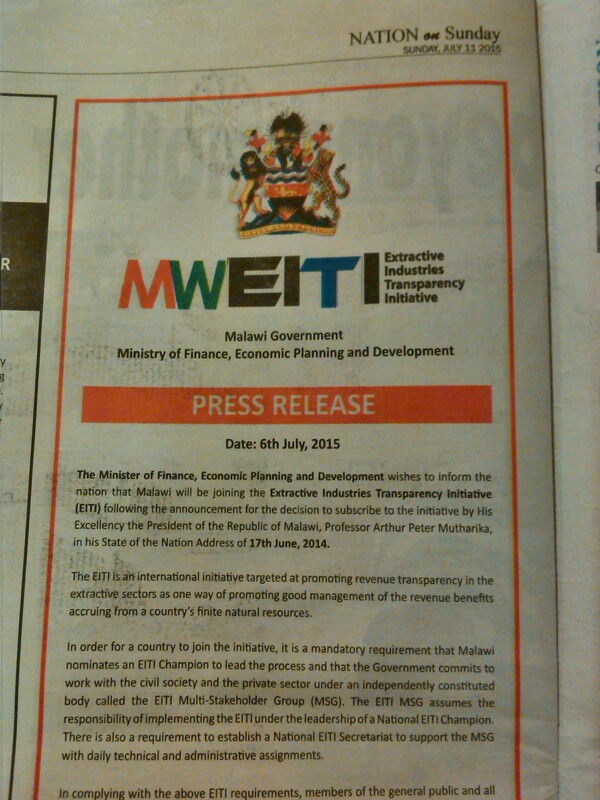 Malawi will be joining the Extractive Industries Transparency Initiative (EITI) following the announcement for the decision to subscribe to the initiative by His Excellency President of the Republic of Malawi, Professor Arthur Peter Mutharika, in his State of the Nation Address of 17th June, 2014. The Press Release also announces that the EITI Champion, a requirement of the EITI Standard, will be the Minister responsible for finance, in this case, Hon. Goodall E. Gondwe, and that the multi-stakeholder group and interim National EITI Secretariat are in place. Members of the general public and all stakeholders are further informed that for a starter, the EITI process in Malawi will cover mining. Other extractive sectors (such as oil and gas) shall be considered at a later stage. That being said, it will be the decision of the multi-stakeholder group to determine by consensus the scope of the first EITI report. The Members and Alternates of the MWEITI multi-stakeholder group are copied below, followed by two images of the Press Release in today’s paper. 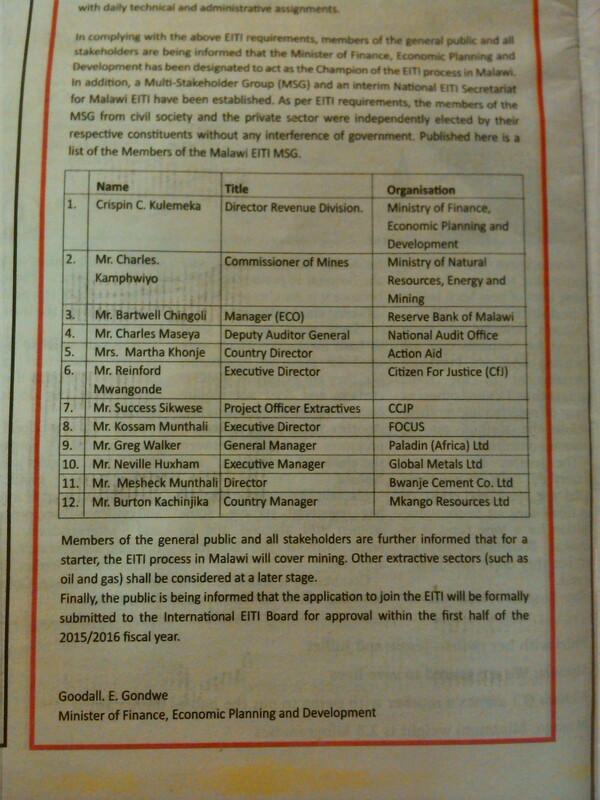 For further information, take a look at my Eye on Malawi’s EITI column that features in the Mining Review and is subsequently posted here.